Carron are one of the leading British manufacturers by using traditional methods to create some of the finest cast iron products currently available in the UK. The cast iron inserts that Carron produce are available in a wide variety of traditional designs and finishes to complement the quality of the product. One of the best cast iron inserts that is available from Carron is the Celtic Arch which is available in 4 different polished finishes and comes in a traditional Victorian arched design to suit any home. The Celtic Arch is also available with a choice between a natural gas or an LPG fire as well as a solid fuel option all of which are suitable for a class 1 & 2 chimney. Each of the cast iron surrounds available from Carron are provided with a black granite hearth available in a variety of sizes and also available with options of a tongue and a slabbed hearth for solid fuel fires. 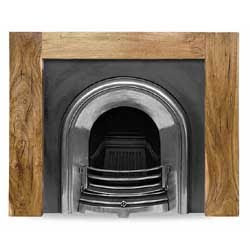 Carron have created some of the most unique fireplaces available with intricate detailing throughout the insert. The best example of this would be the Carron Rococo Cast Iron insert which features rococo styling in the arch with precise detailing. 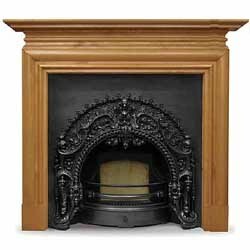 The styles that Carron have incorporated into their fireplaces range from Georgian designs circa 1840 to late Victorian design circa 1905 which truly shows the tradition of Carron. A lot of Carron cast iron inserts are available with tile options so that you can customise the look of the fireplace to how you want it. There is a large variety of tiles that have been made available by Carron to make sure that you can choose exactly the one you want. A number of these tiles can also be purchased so that they can be changed to suit your room if you redecorate or simply fancy a change. Carron cast iron inserts are a quality product and some of the finest cast iron inserts available, they are currently available from the Fireplace Megastore.